Since electric power generation stations, wastewater treatment facilities and wastewater disposal at large industrial complexes use such large volumes of water; they are generally located adjacent to a ready supply of substantial amounts of water. If there is not a lake, river or other large water source nearby for such a plant when under construction, a lake or other water source may be built. The first, or primary section of a typical wastewater treatment facility will receive the incoming wastewater or influent via a channel or basin, into a screenhouse. It is necessary, initially, to remove from the influent large solid materials or those which are not water soluble. The screening building using sits astride the influent stream. At the inlet area where wastewater en- ters the plant, you will find a series of screens, pumps and other influent stream treatment apparatus consisting primarily of traveling rakes and/or screens of various configurations. The source of influent from industrial, commercial or public wastewater gathering systems often dictates the extent of conditioning necessary to prepare the stream for further clarification. The technique involved here is usually applied to surface water processing (as in the case of electric generating stations) or to wastewater influent streams from industry and commercial establishments as well as municipal sanitary sewage gathering systems. and with the acute angle on the downstream side (Figure 3). They may be hand-raked, but most modern plants are equipped with mechanical raking facilities. Screening techniques have been adapted in recent years to remove very fine solids, down to seven microns, by high mesh metal or cloth media so that they overlap the sedimentation processes and capability. Screenings removed from domestic sewage by coarse screens range in quantity from 0.5 to 3 cubic feet per million gallons; by fine screens up to 30 cubic feet per million gallons. Straight racks are used for hand-raked screens and some that are mechanically raked. Curved screens are mechanically cleaned. Fine screening is applicable to a wide range of industrial and commercial wastes and for domestic wastewater and sanitary sewage that have been stabilized by biological or chemical procedures. In the latter application, they can act as “advanced treatment” devices. There are three general types of mechanically operated rakes; two for use with the common flat screen and one requiring curved bars. One type of rake for flat screens consists of a rake moving slowly upward over the backface, or effluent side, of the screen, carrying the screenings to the top of the screen. There the screened materials are dropped into a conveyor or bucket, into a grinder, or onto a draining platform. In the second type the rakes pass upward on the face, or influent side of the screen, dump their burden, disengage the screen and then move downward. During much of the time the amount of screenable matter in the sewage is much less than the maximum for which the rake was designed. Several of the makers provide clock-actuating mechanisms to allow automatic intermittent operation at adjustable intervals. The traveling screens rotate to remove trash, marine life and refuse from water being channeled into the plant water system. Some utilize coarse mesh, heavy-duty screening or remove floating branches, twigs or larger refuse. Others use fine mesh for safe removal of small marine life and fish and return them to the water source. This is the type generally used for screening fresh water for use in electric generating stations, but similar type screening devices are also used in sanitary wastewater treatment influent streams. Since these large mechanisms rotate, they will have electric motors, gearboxes and chain drives to propel them. 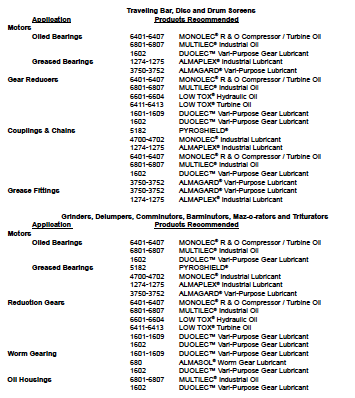 Depending on the make of electric motors, LE’s 1275 ALMAPLEX® Industrial Lubricant, LE’s MULTILEC® Industrial Oil or LE’s MONOLEC® R & O Compressor / Turbine Oils provide superior lubrication for this important power source. Because the equipment handles water, resistance to water and water separation is sought. LE products are unsurpassed in this area. Since many of these gearboxes and hydraulic sys- tems are in close proximity to the water, LE’s LOW TOX® Turbine and Hydraulic Oils can be used to pro- tect not only the equipment, but also the sensitive equatic environment. On the traveling screens, each section must be thoroughly lubricated to allow movement without binding. Since the sections move through the influent stream, they must be lubricated with water-resistant grease such as LE’s 3750 - 3752 ALMAGARD® Vari-Purpose Lubricants, LE’s 1275 ALMAPLEX® Industrial Lubricant, LE’s 9901 ALMASOL® SYNTEMP® Lubricant or LE’s 5182 PYROSHIELD®. Fine screens are effectively utilized in industrial waste pretreatment for removal of solids not easily handled by sedimentation basins. Waste of a fibrous character or particulate matter easily separated from water, is subjected to treatment with fine screens. 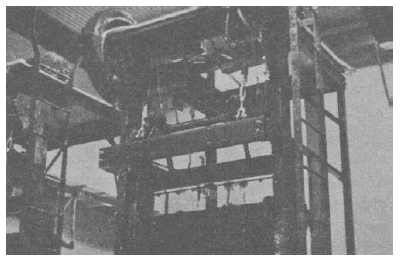 For the disc screens, stainless or alloy wire cloth up to approximately 60 mesh is mounted on a rigid circu- lar frame which rotates on a shaft in a channel perpendicular to the direction of the flow. The lower half is submerged so that solids impinge on the surface of the screen and are lifted in the rotation cycle above the level of flow, where they can be continuously removed by water or effluent spray. In drum screens, the straining fabric is mounted on a cylinder which rotates in a flow channel. The construc- tion varies, principally with regard to direction of flow through the fabric, either into one end of the cylinder with solids collection on the interior of the fabric covering or from outside the drum through the fabric to the interior with solids collection on the exterior. Unless mechanical or hydraulic conveyance is provided, the screenings are deposited on a platform or in containers, to be removed at intervals by hand. Belts or other conveyors are used in some large plants, transporting the screenings to a desirable disposal points or to hoppers for intermittent removal by trucks. If screenings are to be disposed of by shredding, two methods are commonly used. One involves continu- ous shredding in the influent channel. The second incorporates the collection of solids on a screen, removal from the screen by scrapers or by back-flushing, and then final grinding. Both of these methods transfer the solids to the settling tanks where the screenings are removed with other sewage solids and pumped to sludge digesters with the sludge collected in the settling tanks. The first method is comminution which is the reduction of particles to small size. 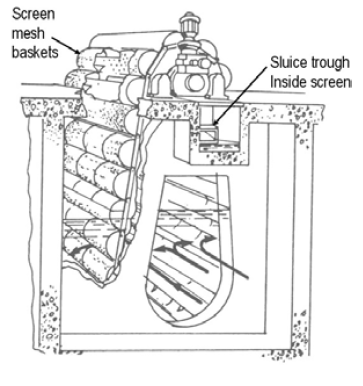 In sewage treatment, the term applies to a process of cutting or shredding by apparatus inserted in the channel of flow. Trituration (by Triturator), macerating (by Maz-o-rator) and disintegration (by Disintegrator) are terms having similar applications. Comminution (with comminutors) can take place as part of influent pumping or in a pipeline system when impellers or cutting blades mounted on the impeller shaft revolve against a stationary surface. 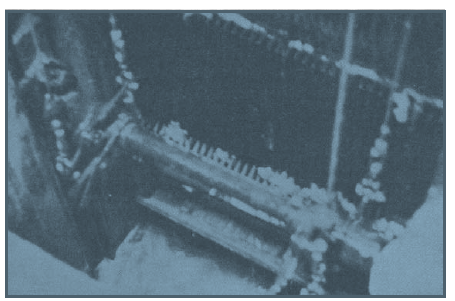 In the second method, screening grinders may be of the ham- mermill type with knife-edge hammers operating against sta- tionary, wedge-shaped surfaces. These are usually separate from the raked screen and receive the screenings as they are removed. After disintegration, the screenings drop into the plant flow stream for further processing. 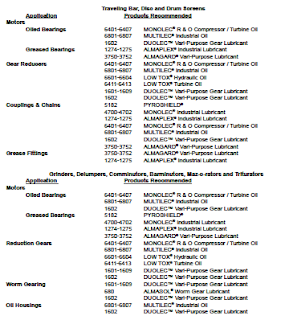 Here are some lubrication suggestions for typical screening and grinding applications.